‘Conversations Series II’ artist Amy Ellison. ‘Other Transmissions’ is a touring project exhibiting at Artlink Hull from 29th March, informed by ‘Conversations Series II’ artist residencies led by Venture Arts with programme partners Castlefield Gallery and the Whitworth. Following the launch in Liverpool, ‘Other Transmissions’ travels to Artlink Hull, where from 29 March – 21 June new works developed through ‘Conversations Series II’, will be shown alongside key works from the Whitworth’s Musgrave Kinley Outsider Art Collection, one of the most significant public collections of Outsider Art in the UK. Works on loan from the collection will include pieces by Henry Darger and Judith Scott. On the 28 June at Paradise Works, Salford, 6-9pm will host a film screening of ‘Other Transmissions’ group film and an exclusive live immersive intervention by Joe Beedles. ‘Other Transmission’ will complete at The University of Salford, New Adelphi Gallery, from 1-31 Oct, where several pieces produced by the ‘Conversations Series II’ residency artists will feature alongside documentary material of the ‘Conversations Series II’ process, captured by the university’s BA Graphic Design students. Visual responses in the form of zines, riso-prints and film will be shown with the exhibition tour. ‘Conversations Series II’ has supported six artists living and working in the North West of England to undertake a five-month residency at Venture Arts Studios in Hulme, Manchester. 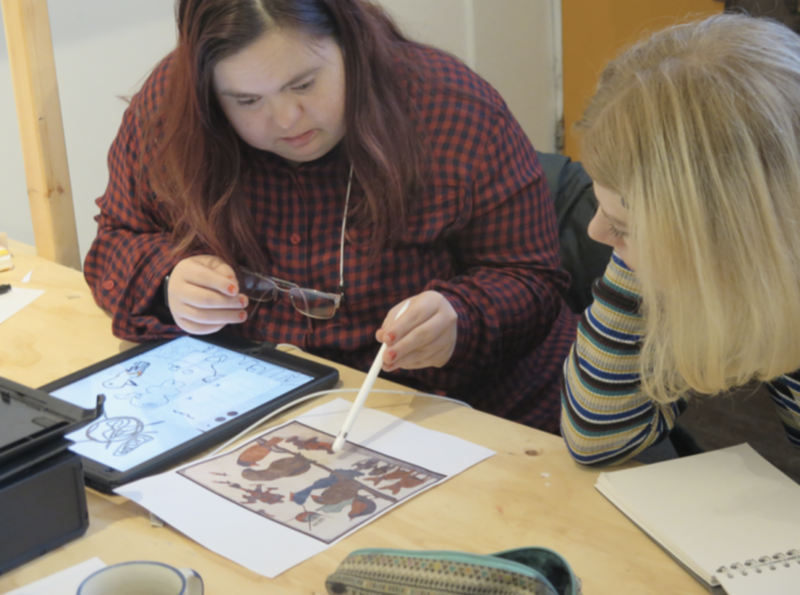 The artists are a diverse group of learning disabled and non-learning disabled artists selected based on the quality of their practice, and their openness to exploration, experimentation and collaboration. This series delves into feelings and thoughts about the labels placed upon people by society, and for artists and the art world more broadly. The participating artists have spent time with The Musgrave Kinley Outsider Art Collection at the Whitworth, researching collection pieces, this process stimulating conversation on how artists are labelled, and how this can sometimes define their work and themselves as ‘different’. New work produced by the ‘Conversations Series II’ artists evidences a sense of play, something that has featured heavily throughout the residency process. Experimentation has been key and the artists have explored new materials and techniques including latex, clay, sound and video sampling. The resulting works include audio-visual pieces, a film consisting of low-fi surreal episodes developed by the group, making use of green screen footage as well as 3D scanned imagery. Other visual dialogues are communicated in the form of brightly coloured works and drawings embodying a strong sense of the surreal, stemming from dark humour featuring heavily in YouTube clips viewed, and opening credits from 90s game shows. Castlefield Gallery have in particular supported the residency with artist recruitment and selection processes, as a critical friend, and provided the artists with mentoring to encourage reflection at key stages throughout the project. ‘Conversations Series’ is a multi-year programme conceived by Venture Arts, working in partnership with Castlefield Gallery and a wider network of national organisations. The programme extends across multiple years, curated as a discursive and art-making journey designed to enable and empower the voices of learning disabled artists, focused on the power of their work as opposed to ideas of ‘art world status’. Through a series of dialogues, residencies and artistic collaborations, Venture Arts seeks to enable new and challenging work to be created, whilst exploring the place of learning disabled artists’ work within the context of the national and international contemporary visual art scene, and contexts such as the Outsider Art Movement and the Disability Arts Movement. ‘Conversations Series’ began in 2015/16 with OutsiderXchanges, a partnership between Venture Arts, Castlefield Gallery and the BALTIC Centre for Contemporary Art. Be the first to comment on "‘Other Transmissions’ travels to Artlink"